This year’s VMworld conference saw the announcement of VMware’s new vCloud Director product, a culmination of the vision for the cloud computing the company articulated last year and a significant step forward in providing a true enterprise-grade cloud. This is virtualization 2.0—a major rethink about how IT should deliver infrastructure services. VMware believes that the secure hybrid cloud is the future of enterprise IT, and given their success of late it is hard to argue against them. vCloud Director (vCD) is interesting because it avoids the classic virtualization metaphors rooted in the physical world—hosts, SANs, and networks—and instead promotes a resource-centric view contained with the virtual datacenter (VDC). vCD pools resources into logical groupings that carry an associated cost. This ability to monetize is important not just in public clouds, but for private clouds that implement a charge back to enterprise business units. Multi-tenancy is a basic assumption in the vCD universe, and the product leverages the new vShield suite to enforce isolation. Management of vCD is through the vCloud API, a technology VMware introduced a year ago, but which has now matured to version 1.0. The product vision and implementation are impressive; however, a number of security professionals I spoke with expressed disappointment in the rudimentary security and management model for the vCloud API. vCloud is a RESTful API. It makes use of SSL, basic credentials and cookie-based session tokens as a basic security model. While this is adequate for some applications, many organizations demand a more sophisticated approach to governance, buttressed with customized audit for compliance purposes. This is where Layer 7 can help. Authentication against virtually any security token (SAML, Kerberos, X.509 certificates, OAuth, etc). Fine grained authorization to individual APIs. Virtualization and masking of APIs. Versioning of REST and SOAP APIs beyond vCloud basic versioning. Augmentation and extension of existing vCloud functions. Transformation of any GET, POST, DELETE, and PUT content. Validation of XML structures such as OVF containers. Threat detection, including threats embedded in XML OVF files. Live dashboard monitoring of API usage. Figure 1: vCloud Director API management and security with CloudSpan from Layer 7. CloudSpan is the basis of real cloud governance. In contrast to other solutions that run as third party services or attempt to broker security from you own local data center, CloudSpan runs as an integral part of the vCloud Director environment. CloudSpan runs as a VMware virtual image that is easily incorporated into any VMware virtual infrastructure. At Layer 7,we fundamentally believe that the security, monitoring and visibility solution for cloud APIs must reside inside the cloud they are protecting—not off at some other location where the transactions they proxy are subject to attach as they traverse the open Internet. Local integration of the security solution as an integral part of the cloud infrastructure is the only way to properly secure cloud APIs with sophisticated access control and to offer protection against denial-of-service (DoS) attacks. 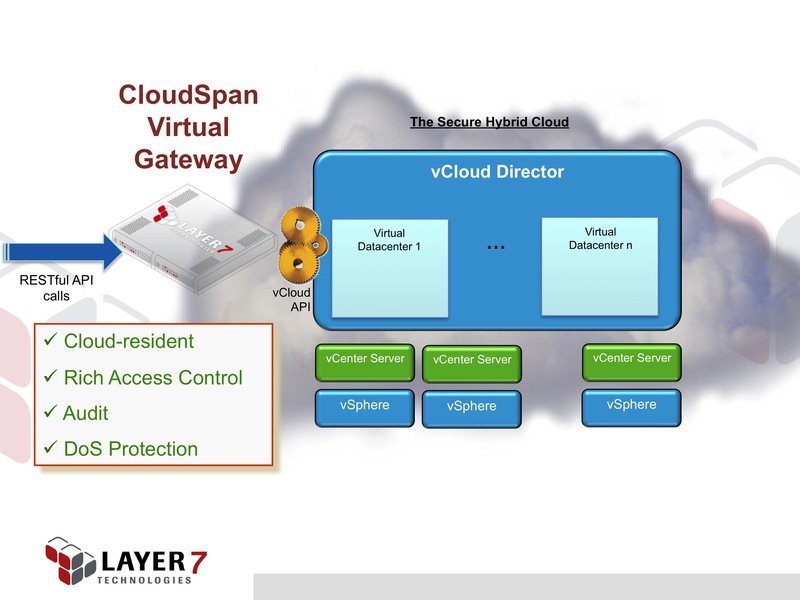 For more information about how to secure and manage the vCloud API and vCloud Director, please see the cloud solutions page at Layer 7 Technologies.